There are differing leaks out there regarding the track list for Rock Band 2. Both are unattributed, one to a friend of a friend who got a look at an email from Harmonix to MTV or something. But in the interest of rumormongering, we'll repeat both with the caveat that there is no way of knowing if this stuff is for real or not. But if, combined, they're half right then this could be one hell of a track list, possibly the best of any rhythm game. Also, an IGN Insider interview (transcript provided by reader Max) let slip that buyers of Rock Band 2 will have access to all of the songs off the original Rock Band disc, available as free DLC. Full details on both after the jump. Rock Band 2 and Guitar Hero World Tour create an interesting situation for gamers. If you bought Rock Band 1 then chances are you'll feel cheated by the release of RB2, thus you'd think that GHWT would be the way to go as it somewhat redefines the music gaming genre. However, if you didn't buy the first Rock Band then I would absolutely agree with notagoth. Immediately upon purchasing Rock Band 2 you'll have the ability to download a huge library of songs, as well as all of the songs off of the original disc as a free download. Then again, Guitar Hero World Tour does allow users to create and share their own songs, so it's really only a matter of time until the Rock Band library is eclipsed. At the end of the day it could come down to which series has earned your allegiance over the last year since RB's original release." And on to the leaked track lists. The first is from Demp, a commenter on 8bitfix, and he's got the FOAF who saw the email source. That's like fourth-hand hearsay, but whatever, this ain't court. 81 Main Drag, The A Jagged Georgeous Winter. And then from Loading Reality, which notes that this numbers only about 60. Some of the tracks are the same as the list above, just in a different order. "Keep in mind, some of these could easily be DLC that's in the works," Loading Reality writes. A wise caveat. So there you have it. Could be real, could be bs, again that's the fun of rumors. 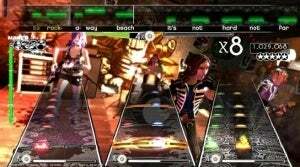 But even if this is in-progress thinking, and not final stuff, it shows Harmonix is not F-in around, and will move to counter Guitar Hero: World Tour's peripherals and custom song features with outstanding content. Do Your July 4th Resolutions Yet?